We are a leading Manufacturer and exporter of cryogenic oxygen plants, cryogenic nitrogen plants with cylinder filling station, oxygen gas production plant, cylinder filling oxygen plant, industrial & medical oxygen and nitrogen gas plant. DCPL is known for manufacturing, fabricating and exporting quality cryogenic oxygen gas plants with advanced technology imported from an acclaimed Italian company. Our liquid oxygen machinery is designed and developed by our experienced engineers. Our engineers keep the tab on the new developments in cryogenic distillation technology. Driven by customer satisfaction, we always endeavor on delivering cryogenic oxygen gas plant that meets the needs of our customers. 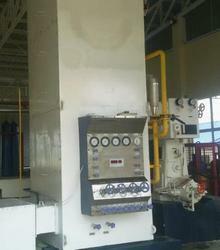 Moreover, our liquid oxygen machinery is low maintenance, cost-effective and durable. Our plants are manufactured at our factory in New Delhi. Working of our machinery is based on the process cycle of Linde Claude, developed in 1930s and updated numerous times since then. Being a company that is focused on delivering best experience to our customers, we ensure that quality of our products is outstanding. Our engineers take utmost care in implementing each aspect of the design with precision and detail. All components used in the fabricating of the machinery are quality tested before it is used in the fabricating. Components are sourced only from the approved vendors. Manufacturing processes are in total compliance with international standards and procedures. For our quality control compliance, we have been given ISO 9001:2008 and CE certifications. DCPL is engaged in manufacturing and fabricating cryogenic oxygen plant using internationally acclaimed Italian technology. Designed and manufactured as per international standards, our cryogenic oxygen gas plant is the first choice of customers from all over the globe. Manufacturing of liquid oxygen plants is carried out at our factory in New Delhi (India). As our plant machinery is ISO 9001:2008 and CE certified, it goes without saying that our oxygen production plants are reputed for delivering world-class performance. Our premium quality plant machinery comes in different sizes and capacities ranging from 20 liter/hour to 500 liter/hour with guaranteed generation of oxygen with purity up to 99.7%, which is excellent for medical and industrial applications. Through our commitment to quality, we have become a trusted name in the manufacturing and engineering sector. Awarded with certifications such as ISO 9001:2008 and CE, we offer our customers cryogenic oxygen that is unbeatable in performance as well as prices. Functioning of our cryogenic oxygen machines is based on the process cycle of Linde Claude, pioneered in 1930s and have since been updated many times. Cryogenic grade stainless steel is used in the making of the machinery ensuring production of high purity oxygen. We are leading supplier & distributors of Cryogenic Gas Cylinder. We obligated to meet the quality standards as per the customer demands. We are leading supplier & distributors of Emergency Medical Equipment. We obligated to meet the quality standards. Looking for Cryogenic Oxygen Plants ?